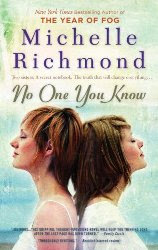 To celebrate the May 19th release of No One You Know author Michelle Richmond has offered my visitors a chance to win a copy. Thank you Michelle! All her life Ellie Enderlin had been known as Lila’s sister—until the day Lila, a top math student at Stanford, was murdered, and the shape of their family changed forever. Twenty years later, Ellie is a professional coffee buyer who has never put down roots. When, in a chance meeting, she comes into possession of the notebook that Lila carried everywhere, Ellie returns home to finally discover the truth about her sister’s death—a search that will lead her to Lila’s secret lover, to the motives and fate of a man who profited from their family’s grief, and ultimately to the deepest secrets even sisters keep from each other. From the bestselling author of The Year of Fog (“Highly recommended [for fans of] authors like Jodi Picoult and Jacquelyn Mitchard.”—Library Journal [starred review]), this is a riveting family drama about loss, love, and the way hope redefines our lives—a novel at once heartbreaking, provocative, and impossible to put down. Michelle Richmond is the author of The Year of Fog, Dream of the Blue Room, and the award-winning story collection The Girl in the Fall-Away Dress. A native of Mobile, Alabama, Michelle lives with her husband and son in San Francisco, where she is at work on her next novel. To enter to win No One You Know visit Michelle's website and leave a comment here telling me one thing you learned about Michelle or her books. Be sure to leave me your email address if you don't have a blog or it's not in your Blogger profile. Open to US only, no PO boxes please. One main entry per household. Giveaway ends May 19th and the winner will have 48 hours to respond to the winning email or a new winner will be selected. I learned that Michelle Richmond lives in San Francisco & is working on her next book. I learned that she is married and has a son. I learned that she's a native of Mobile, Alabama, which is pretty cool. I didn't know anything about Michelle Richmond, so everything said about her on here is something I learned. Michelle holds an MFA from the University of Miami, where she was a James Michener Fellow. I learned that her playlist for The Year of the Fog was Yo La Tengo, Beulah, Walty, Morrissey, Steve Forbert, Laura Cantrell, Tom Waits, Wilco, Bruce, Chris Isaak. That she is from Mobile, Alabama. I learned that she won the 2009 Hillsdale Award for Fiction. I found out that Michelle holds an MFA from the University of Miami. She has taught in the MFA programs in Creative Writing at the University of San Francisco, California College of the Arts, St. Mary’s College of Moraga, and Bowling Green State University. Wow busy lady! I learned that she is from Alabama. I learned that her first novel was Dream Of The Blue Room (2003). I learned that Michelle is from Mobile, Alabama. I also learned that she is the recipient of the 2009 Hillsdale Award for Fiction from the Fellowship of Southern Writers, the Mississippi Review Fiction Prize, and the Associated Writing Programs Award. I love writers that live or have lived in the South, as many of them write in a way that reminds me of my own Southern roots. Great giveaway! Thanks! I am a follower of your blog.